I’m going to take a pause between my articles on arrogance (here and here – part 3 coming next time) this week, because I had an experience last week that got me thinking and that I’d really like to share. So, if you know me (or read the ‘about me’ on this site) you’ll know that mountain biking is a big part of my life. I’ve been riding mountain bikes for about 17 years and I’m just a teensy bit obsessed. I ride whenever I can, I subscribe to several mountain biking magazines, I spend too much money on my bike and gear, I bore my wife with headcam video of my rides, I train in the gym to be stronger on the bike, and I think about it a lot when I’m not doing it. In other words, it’s quite important to me. The other day, I showed one of these headcam videos to a very good friend of mine (who’s not sporty). He was genuinely confused as to why I bother – to his mind it was dangerous and somewhat pointless. He asked me why I ride; the answer was complex. I ride for a lot of reasons, nearly all of them intrinsic (as in the motivations are all intrinsic), including fulfilling a desire for challenge, matching challenge with skill, mastering a complex skill, being in nature, interacting with friends, and feeling a sense of accomplishment. But more important than any of those things is the fact that mountain biking forces me into the moment in a way that very few other things can. I need to explain this a bit more. I struggle to be in the moment. My head is often miles away, in the future, or abstracting about something. It’s an effort to bring it back, and one of the reasons I meditate regularly. Mountain biking brings me into the moment in a very real and visceral way – if I’m not concentrating, I’m falling off (which hurts), but more than that, there’s no room when I’m riding for anything but the trail and my relationship to it, through my bike. It contracts the world down to a single experience, and I love it (Csikszentmihalyi describes this feeling as flow). If you want to take a pause at this point and see one of my headcam videos, you can here (apologies for my ego). 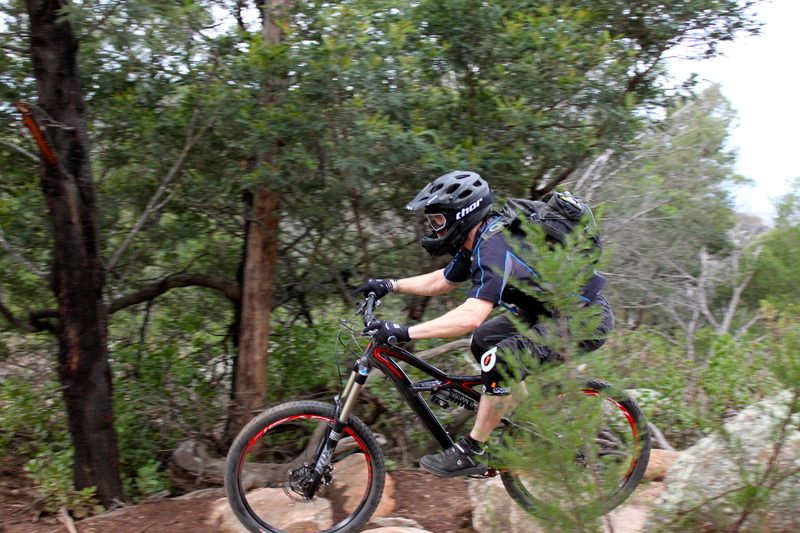 Because of these intrinsic motives, for me, mountain biking has always been about the internal experience. I’ve deliberately avoided using a trip-computer, a stopwatch, or even a watch when I ride, because I’ve never been interested in knowing how far I’ve gone or for how long, or how fast; the experience was enough. A satisfying ride was one where I was present and riding well (by my own standards). Despite my misgivings, recently I started using an app on my iPhone called Strava. Strava is great concept that uses a GPS device to track you when you ride (or run, or do anything else outside). At the end of the ride you can upload your info to Strava and (here’s the cool part), it recognises which tracks you’ve ridden (or you can create new ones) and automatically calculates your time on that track. That in itself is good, but it also automatically rates your performance against your previous times, and against all the other people who have ridden that track (for a premium fee you can even rate yourself against others by age group or weight category). I got very excited about Strava when I first started using it – I even got a plug-in device (birthday present from my wife) that makes the GPS on my phone more accurate. OK, so I’m getting to the point… Here’s the problem: over the past few months I’ve started using Strava more and more (not just for mountain biking, but for running and in the gym with a heart-rate monitor). I’d get back from a ride and immediately look over my Strava runs to see if I’d improved my time on a given run. Worse, I started pushing myself harder and faster on the trails, not to challenge myself or immerse myself, or to increase my skills for their own sake, but to beat my Strava time. This came to a head last Wednesday. I went riding with a good friend, and both of us felt we were riding really well. When I got back to the car I found that the Strava app had crashed about a quarter of the way into the ride (before any of the descents). I did not react well. There it was – I was really upset – so much so that I kept getting repeating, intrusive thoughts about it. It took me a couple of days to get over it. My ride had been ruined. And then I realised that, without me being aware of it, my mind had been hacked. What had gone wrong? How had I gone from purely intrinsic motives, eschewing any type of extrinsic feedback, to being almost completely reliant on an external device for my mountain biking satisfaction? The answer is relatively simple and more than a little bit disturbing, because it has ramifications for me and for pretty much everyone else, far beyond mountain biking. By using Strava I had been creating a neurological reward loop based on our inbuilt desires for tribal ranking and approval. We’re competitive because we’re hardwired to be – through most of our evolution our survival (i.e., our ability to pass on our genes) has been largely dependent on our ability to attract a mate, the odds of which, in turn, were enhanced by our standing within our tribe. By getting immediate feedback regarding my standing within a group that I relate to (i.e., other mountain bikers) that (very primitive) part of my brain was getting excited about its status, especially when I moved up the ranks by riding faster. This was all happening subconsciously, but the feedback loop I’d created was making it seem more and more important, and overriding my original motives. I certainly don’t want to breed with mountain bikers, but my dumb brain gets rewarded for behaviour that increases my potential standing within a group, even if it’s purely imaginary. Worst of all, I’d actually started to put myself at risk, by pushing myself to go faster for reasons that I didn’t have any real control over. The reason this realisation scares me so much is that something I really love was co-opted by a primitive part of my brain, because I used a piece of technology. Don’t get me wrong, I love tech, and there are a lot of awesome ways it can enhance us as human beings (I’ll write a blog post about this one day soon), but it’s also really easy to set up tech that hacks our really primitive functions. This is, no doubt, why Strava is so successful. There’s another popular piece of technology that does exactly the same thing – you might have heard of it, it’s called Facebook. Why do we use it? Mostly because it hacks straight past our conscious mind and into our primitive social ranking system. Every time we get a new Facebook ‘friend’ that system is rewarded, every time we write a post and someone ‘likes’ it, we get rewarded (etc.). At a most basic level, Facebook makes us think we’re going to get laid. Have a think about this next time you get that almost overwhelming desire to check your Facebook newsfeed. But Facebook is just one example of how technology can hack our most primitive systems, making us behave in ways that are counterproductive (or contrary to what’s important to us as evolved humans). The phone in your pocket probably does the same thing (and it’s got Facebook on it – yes, it does, doesn’t it…). If we’re not careful, we become slaves to our machines, pressing buttons for a neurochemical reward that make us feel good, instead of using that technology to enhance our lives. So am I going to keep using Strava? I’d really like to say no – that I’m going to go back to riding without any sort of recording device, to get back to the pure internal experience. But, probably, I’ll keep using it. I’ve realised that I do enjoy a little extrinsic feedback (and, yes, I realise that’s because of everything I’ve written today), but I’m going to try an experiment: I’m going to try and use Strava as another piece of information, rather than my main source of feedback. I’m going to try and be mindful of my own intrinsic motives and subjective state when I ride, and use Strava as a way of reminiscing afterwards. I think the trick is to be aware of what’s going on so that you can make conscious choices regarding your behaviour (this is probably the trick to being a modern human being). Having also had the experience of catastrophic Strava failure ruining several recent rides, I was also forced to question what it was about the ranking system that became important enough to override the simple pleasure of just going for a ride. Until my data failed to load and compare me with other riders, I had derived satisfaction from simply knowing that I was riding at my best – something that had nothing to do with how I measured up against other people. This also brings to mind my involvement with MTB racing, something I’ve been dabbling in recently with moderate success. When I’m riding down a hill in a non-competitive context, the enjoyment is derived from similar reasons to those described above. As soon as it’s a race run, enjoyment quickly gives way to a total focus on putting together a faster run than everyone else (ie not making any mistakes, going as fast as possible and calculating the risks). I won’t deny that this comes with a significant sense of reward for getting on the podium, which is enjoyable, but the sacrifice is clearly the enjoyment of the activity itself. So why do we put ourselves through this? Does it really come down to some ancient hard-wiring continually driving us to be better than other males in the pack so we have a better chance at attracting a mate? What if we already have a mate? Is it about perpetuating our gene pool with as many mates as possible? What about women using Strava or racing? I’m all for the idea of being more mindful of these underlying processes, but I’m not sure if this will bring the fun back. Perhaps it’s all or nothing. Right now the prospect of going for a ride without the possibility of a KOM or PR is similar to the way I felt during the first week after I deleted my CrackBook account.